First Project for the New House!!!! Hi everyone I hope everything is going well. The weather to start the week in NJ has been beautiful. Peanut and Reesses have spring fever for sure. I can’t wait for them to have their yard!! The house continues to move along and I finally was able to do my first project for the house. 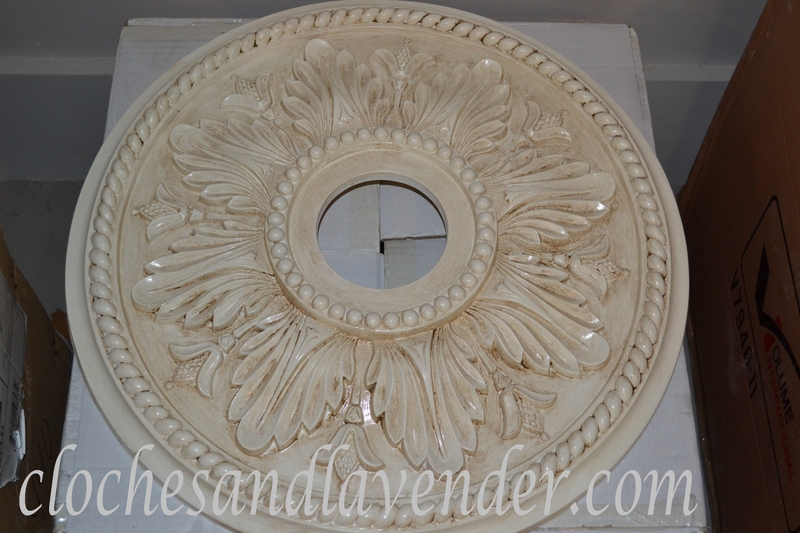 I LOVE ceiling medallions and they can cost a fortune if finished. I purchased five from Architectural Depot. They have a fantastic selection, styles and great prices. 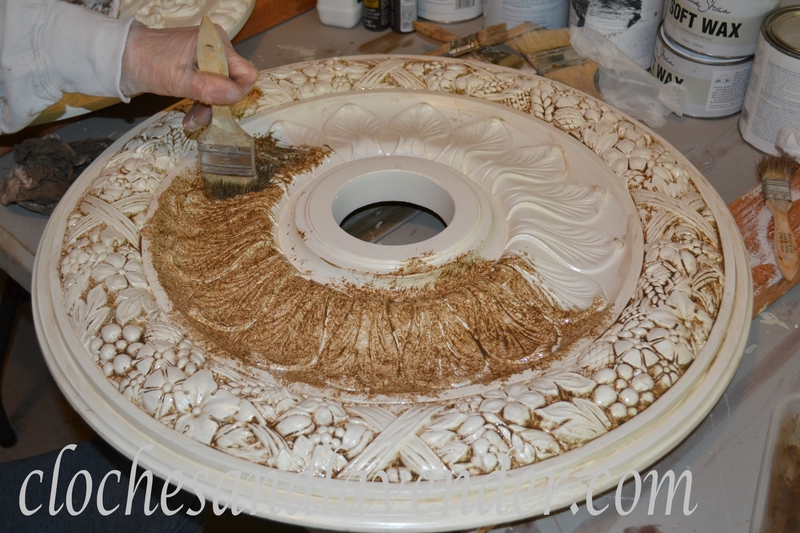 I made everyone different starting with painting the base coat in Mannequin Cream from Benjamin Moore and used Raw Umber glaze to age each medallion. They are aged to fit each light they will be highlighting. Lighter ones are for lighter colored chandeliers and the dark ones are to go with darker and aged chandeliers. Yes, I have many chandeliers and overhead lights in our new home. I couldn’t help myself I LOVE chandeliers. I have mentioned that before. I needed to get these finished so the electrician can hang them while hanging all the lights. He may not like us too much when he is finished, LOL. Enjoy the medallions and I hope you like them. 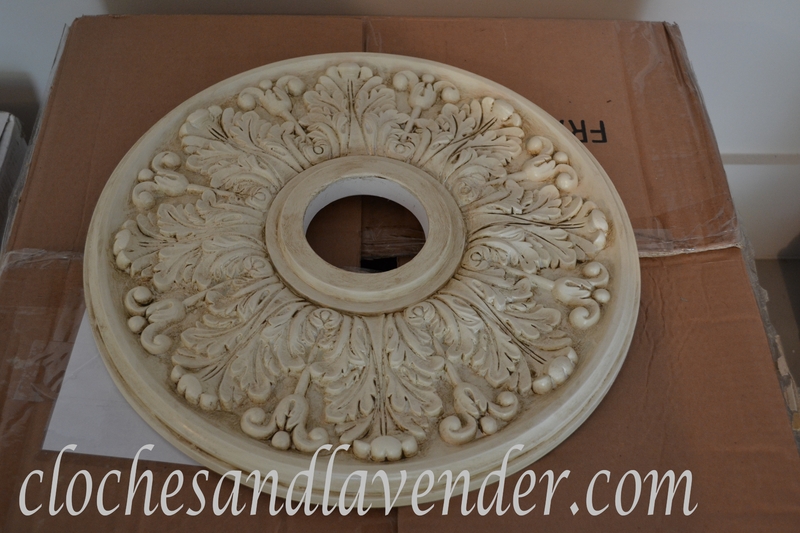 Once the medallions are in place and the lighting is installed I will update my photos and write another post. More news on the house to come. Your medallions are beautiful, Cynthia. You did a fabulous job finishing them! Mary Alice, where do I begin with your kindness to me. I will never ever forget how you have embraced me into the Blog World. Your encouragement has been so touching. I am so happy you like them and think I did a good job!! Can’t wait to see them hung. Carol excited doesn’t even cover how we feel. It has been a very long haul for us. I am so happy you like them. Your medallions are just gorgeous! I love the aging treatment you gave them. Thanks so much for visiting my blog, and for your sweet comments!! Donna thanks so much for the visit back. I am following your wonderful blog via email, you are such a talent. I put your Etsy in my favorites. In the new house there will be purchases made!!! I hope you will follow us along, there will be many projects and decorating!!! Your medallions look beautiful!! 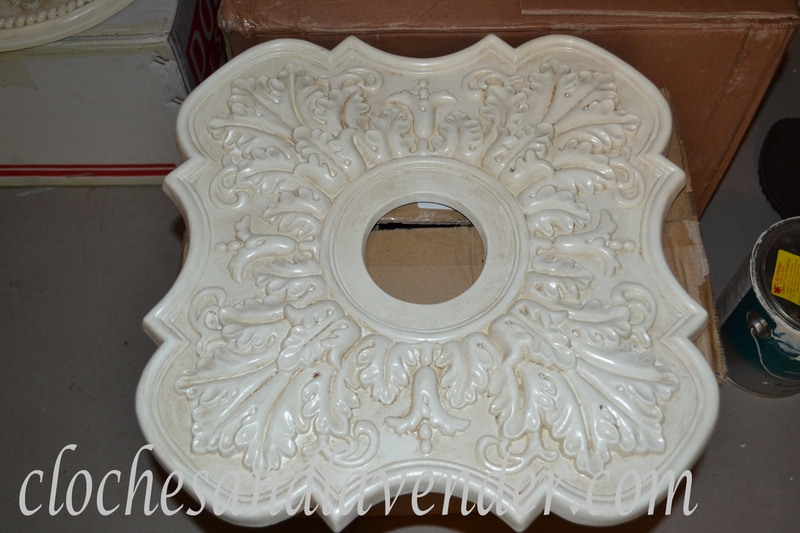 I painted the one in our dining room and gave it an aged look to go with our chandelier…what a difference it made! Thanks so much Martina and I agree I think they make a huge difference! You must be so happy to finally be able to do some projects for the new house!!! I’m so excited for you! 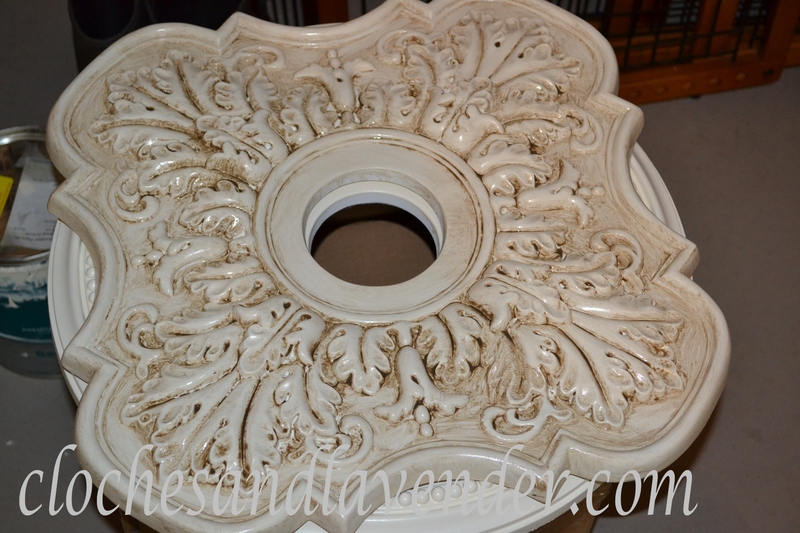 Love the medallions – I keep saying to my husband that we need to add one to our dining room fixture – it would work so well in our traditional home. I truly love medallions I think they add so much and this place does have the best prices and shipping quality is great. It felt so great to get my hands on a project. I have missed it so much, You are such a dear and special friend to me, Heather. Thanks Kathy, you are always here. I can’t wait for them to be hung either. We brought them and the lighting down to the house. Cynthia, you have a fabulous selection of medallions! I just ordered several from the same source. Thanks for the ideas on finishing them. They look wonderful! Betsy my dear friend thanks so much. They have the best selection and prices are great. The quality of shipping is perfect. Enjoy!!! I can’t wait to see them hung. Your medallions are gorgeous. I can’t wait to see them finished on your ceilings. Thanks so much and I am happy you liked them. I can’t wait to see them hung!!! This just made me look up at the ceiling at the medallion around the chandelier if my office. Now I want to “age” it, too!!! I know Ramon is having NONE of that, though! He griped the whole time I made him move the chandelier from my shop to my dressing room to my home office! I even have pictures of him grimacing!!! I love those ceiling medallions. I think those will be a perfect addition to your chandeliers. Kelly thanks so much, I can’t wait to see them hung. It felt so good to be creative!!! 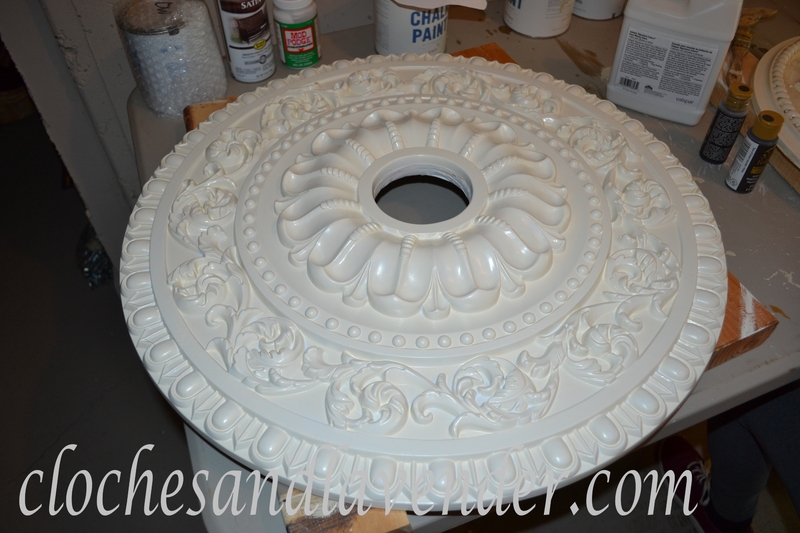 You must be so happy that you can begin to do projects for your new home…Love the medallions…you did a beautiful job…love them!!! Thanks so much Shirley, I am so happy with the way they turned out. I can’t wait to see them hung!! Have a great weekend. Cynthia, I’m in love with your medallions. Your house will look spectacular with every little detail. I love chandeliers too and will be looking forward to seeing all your pretty lights shining on your new home! 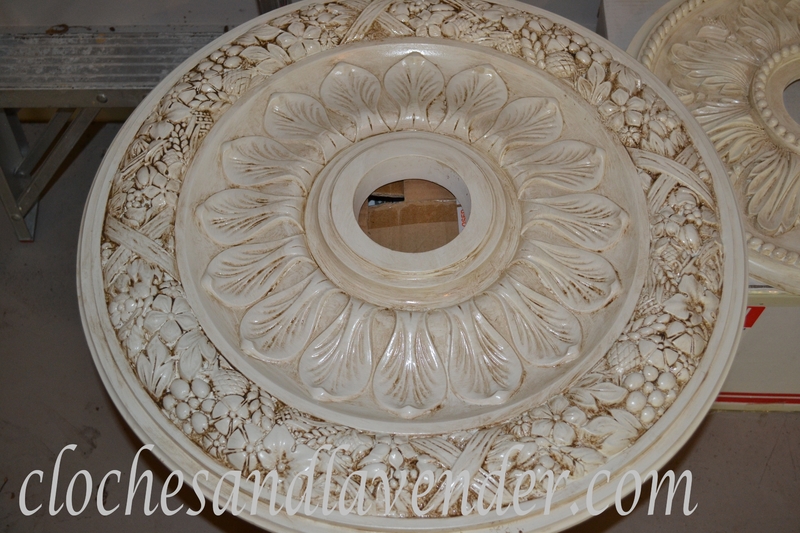 Your medallions are beautiful…..they will look stunning with your chandeliers! I can hardly wait to see them! Thanks so much Des, it felt so awesome to be creative. It has been a long time. I can’t wait to see them up either. Very soon things are really moving!!!! Have a great weekend. I love chandeliers too, and adding medallions really is the perfect way to accent them beautifully, and you certainly did a great job highlighting the details of the medallions Cyn! It’s funny..it’s no secret I’ve been purging and getting rid of everything we don’t need EXCEPT for two chandeliers that were at our previous home of 26 years. For some reason, keeping them is just me holding on to the hope that someday I can have my dream house and when/if I get rid of them I will be saying goodbye to that dream. They’re beautiful and even though I got them both 12 years ago, I love them as much now as I did when I bought them. Thanks so much Doreen, I am very happy with them and can’t wait to see them up with the lights. Don’t get rid of them yet, you never know and if you don’t feel right about it, it isn’t time. Have a fantastic weekend!! beautiful medallions, cynthia! love the square shaped one, esp! i’ll check out architectural depot–tfs:) happy weekend! Lynn, thanks so much and the square ones are great. They are so different and one if for my office/craft area and the other our bedroom. Check them out for sure. Have a great weekend too. Thanks so much Susan, it felt so great to be creative again. I can’t wait to get in the house and get moving!!! Thanks so much Debbie, it was so great t o be creative, it has been a long time!! Oh these turned out beautiful Cynthia – love the aging effect – and house full of chandeliers sounds like my kind of house !!! Hi Suzan thanks for taking the time, I know how busy you are and it means a lot. I am very happy with the way these turned out. I can’t wait to see them up with all our lighting either! Gorgeous look! I can’t wait to see it in place! Thanks so much Anne, we can’t either. This feels like the house that will never get finished due to the winter. Such a beautiful touch for your house! There has been so much progress since I last stoped by. Exciting times for you. I’m so glad!.. Jacqueline thanks so much, there has been a lot of progress but it seems like we can never get it finished. We want it done now, you know. I can’t wait to see the medallions hung. It was fun to be creative again! I’m sure I’d love the color, but why on earth would the color namer at Benjamin Moore name anything ‘Mannequin Cream’ ? Sounds creepy! But then I watched Twilight Zone when I was growing up. Could have something to do with it. Anyway, I like the way your project turned out. Very nice!! Thanks very much and I never really thought about the name before. You’re right a bit creepy. Wow, Cynthia, these are beautiful! You did a fabulous job. Can’t wait to see them on your ceilings! Thanks so much Amy, I worked hard on these to give each one a different look depending on the light. I can’t wait to see these up either. Very pretty! I love ceiling medallions too. Not sure where I got mine from but I know it was online (although HD etc have them). I needed the kind that was made in half since I didn’t want to take my light fixture down. Can’t wait to see these up! I have gotten some from Lowes in the past but I wanted different shapes and designs. They were the same price and I got free shipping, can’t beat that at all! Diana thanks so much and I w ill pop over and follow you back and thank you for the addition to your sidebar. Many things to come!!!! You have finished these beautifully. Going back to read some older posts now. I discovered your blog via your feature on Krisis blog. Thanks so much Tracey I will follow you back as well. Many neat things to come! I just came over from Spotlight. I really enjoyed reading all about you and I will be following you. Congratulations on your new house and I look forward to following along on your new home posts. Mary thanks so much for popping over and I will check our your blog and follow back. Tons of decorating and projects are on the horizon. Stay tuned for new house updates too!! The medallions are beautiful. I just met you over at Saturday Spotlight and came over to say Hi. Loved the photos of Peanut and Reeses. I have a friend who calls her dachshund Jif! Thanks so much for your visit and I hope you will follow along. Jif is great name too! I will be sure to check our your blog! Thanks so much they are up and look great!